JFK and LBJ: The Last Two Great Presidents. Godfrey Hodgson. New Haven, CT: Yale University Press, 2015. Mere weeks after John F. Kennedy’s assassination and Lyndon B. Johnson’s ascent to the presidency, New York Times reporter James Reston offered this assessment of the two men: “President Kennedy’s eloquence was designed to make men think; President Johnson’s hammer blows are designed to make men act.” In JFK and LBJ: The Last Two Great Presidents, Godfrey Hodgson seeks to explore the differences between these two commanders-in-chief—their personas, motivations, priorities, and achievements—in an effort to explore counterfactuals and determine, had he lived, if Kennedy would have followed Johnson’s path into Vietnam, and would he have been as successful as Johnson in spearheading such a tremendously sweeping body of legislative social reform. While he argues that Kennedy and Johnson were the last truly great American presidents, Hodgson posits that JFK would have indeed entered Vietnam as LBJ did, but that his social reform agenda would have floundered. Hodgson, a Distinguished Fellow at the University of Oxford’s Rothermere American Institute, worked as a White House Correspondent for British periodicals during the Kennedy and Johnson administrations. He continued press work for many years and still publishes today, most recently commenting on the state of the 2016 U.S. presidential election. Hodgson has written numerous books, many of which focus on 20th century American and U.S. presidential history. These include the provocatively titled The Myth of American Exceptionalism and the historically adjacent An American Melodrama: The Presidential Campaign of 1968 (with Lewis Chester and Bruce Page). Hodgson’s extensive knowledge, research, and firsthand experience bring immense credibility to his work. Hodgson splits his book into two broad parts: “The Actors” and “The Actions.” In the former, he sketches the backgrounds and characters of the two presidents. Kennedy grew up a member of an affluent family and developed a political mentality akin to British Whig tradition in that as he and his brothers felt that their privilege was accompanied by social and political duties. He won the presidency in 1960 via an organized and deliberate charisma-driven pursuit of the office—a departure from traditional political toiling—that was, at least in part, aided by a mastery of the emerging national media machine powered by television. While Hodgson focuses on Kennedy’s upbringing and political shaping, he devotes much more time to Johnson’s political background. He takes pains to underscore LBJ’s political acumen and legislatively-proven sense of social and moral justice. For instance, in 1957, while serving as the Senate Majority Leader, Johnson demonstrated his mastery of legislative processes by shepherding the passage of the first civil rights bill in over 80 years. The author bookends his narrative with autobiographical accounts, Hodgson’s own personal journalistic work as a British foreign reporter in Washington. On one end of the bookshelf, Hodgson sets the scene of Kennedy’s so-called Camelot as viewed through the eyes of a correspondent sent from London to cover the White House a year after the president’s inauguration. On the other end, Hodgson returns to Washington to cover the 1968 presidential election, only to find a distraught city and a Johnson administration embroiled in an unpopular war in Vietnam. These personal perspectives, although unnecessary to the narrative and irrelevant to the main arguments, do provide the reader with down-to-earth touch-points that are both fun and useful in grounding an otherwise grandiose story. The rift between Kennedy and Johnson supporters carried on up to and even after the assassination of JFK on November 22, 1963. Robert Kennedy never loathed the man more, to the point that Johnson even feared the Attorney General would challenge his succession to the office. Ultimately, no such challenge ensued, and Johnson committed himself to carrying on Kennedy’s policy agenda. At this point in the book, Hodgson’s separation between “The Actors” and “The Action” becomes painfully apparent. The author does a great disservice to his narrative flow by abruptly snapping readers back in time. Just as Hodgson settles readers into Johnson’s presidency and his first address to a joint session of Congress, he whips them back to right after Kennedy’s election in 1960. Whatever his motivation for this problematic structuring, the remainder of the book deals with the major substantive policies and events of each president’s administration. Kennedy’s administration focused almost exclusively on foreign policy, remembered primarily for the president’s master statesmanship as showcased in his dealings with Khrushchev and the Soviet Union. The Cuban Missile Crisis serves as a fine example of JFK’s shrewd statecraft, although his term got to a difficult start with the Bay of Pigs incident and the Vienna summit in 1961. Hodgson achieves the underlying goal of grounding Kennedy’s usually oversized persona by recounting major political events in an appropriately significant but objective manner. Doubtless, JFK deserves much of the admiration conferred upon him, but Hodgson tempers overblown adulation with the hindsight provided by over 50 years of historical inquiry. For instance, Kennedy’s success with Cuba is balanced by the quiet agreement he made to remove missile batteries from Turkey. In his element dealing with foreign concerns, JFK, for most of his time in office, did little to address domestic reform such as African American civil rights. This was characteristic of his generally conservative and cautious domestic policy agenda, which is often retrospectively venerated as more ambitious and progressive than it actually was. As it turns out, Kennedy’s “actual record of legislative success with substantial measures of domestic reform was meager.” What Kennedy and his people did, however, was lay the groundwork of which Johnson would later take advantage. Hodgson paints Kennedy as generally disinterested in civil rights reform except as a matter of political necessity, one he did not come to until his presidency. Even then, it was not at the top of his policy priority list. After Kennedy’s death, Johnson saw the confluence of events that signaled an open policy window, and he seized on the opportunity to push the civil rights bill and a number of other liberal domestic social reform legislations, including anti-poverty, education, health care, and immigration reform. FDR had his New Deal, and Kennedy had his New Frontier; sensing the fertile grounds for reform, Johnson set to carry out his “Great Society” program. Though Kennedy and his New Frontier supporters paved the way and laid the plans for domestic social reform legislation, Johnson’s gregarious personal drive carried it forward, enabled by the fact that the “Kennedy assassination triggered a mood of national self-examination.” Because of the ripe climate, but also because of Johnson’s legislative acumen, Hodgson argues that Kennedy would not have passed such a successful body of legislation had he lived. “The question… is not what JFK would have preferred to do, but what he would have done"
In addition to professional journals, newspaper articles, biographies, and the leading literature on both Kennedy and Johnson, Hodgson dives into Public Papers of the Presidents for both men, oral history interviews found at both the JFK and LBJ Presidential Libraries, and firsthand accounts like the journals of Arthur Schlesinger. Entwined with memories from his own experiences while reporting during both administrations, Hodgson’s book is, without a doubt, one of the most authoritative examinations of presidential policy agendas. While Hodgson accomplishes his mission of answering the two counterfactuals noted above, he fails to satisfactorily qualify JFK and LBJ as the titular “Last Two Great Presidents.” He does, however, succeed in building up Johnson’s reputation, one that is often denigrated for his part in escalating U.S. participation in Vietnam. Because of Hodgson’s account, we might consider reversing Reston’s characterization of the two: perhaps it was Johnson and his social reform success who made men think while Kennedy and his foreign policy dominance made men like Khrushchev act. Johnathon Parker is an officer in the U.S. Army and a Master of Public Policy candidate at the Goldman School of Public Policy, University of California, Berkeley. He is a proud member of the Military Writers Guild, and he writes about military culture and leadership on his blog, Bourbon & Battles. The views expressed are the author's own and do not reflect the official policy or position of the U.S. Army, the Department of Defense, or the U.S. Government. James Reston, Untitled column, New York Times, January 8, 1964, accessed October 5, 2016, http://www.nytimes.com/1964/01/08/washington.html. 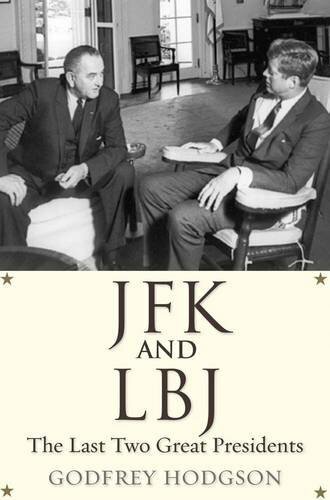 Godfrey Hodgson, JFK and LBJ: The Last Two Great Presidents (New Haven: Yale University Press, 2015), 147.